Lommeformat verktøyet hjelper forhindre bryte kategorien triggerguard eller marring lavere mottaker Fullfør når du installerer eller fjerner roll pin. Verktøyet støtter triggerguard kategorien mens sakte skyve roll pin i eller ut av sin kanal. Inkluderer stål justering pin og tegnestift å hjelpe roll pin fjerning og installasjon. Spesifikasjoner: aluminium, eloksert. Støpt termoplast håndtak, 1-7/16"(3,6 cm) diameter. 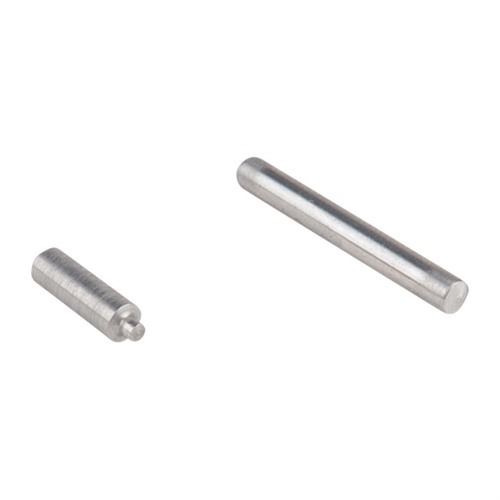 Skruen, stiften og justering pin. This product does what the description says. If it only saves you from wrecking one receiver it's paid for itself. It's easy to use and comes with detailed instructions. Does exactly what it says, super easy to use. Well worth it. Wouldn't build another with out it. I added a few wraps of electrical tape to cover the pusher where it would rest on the lower just in case. 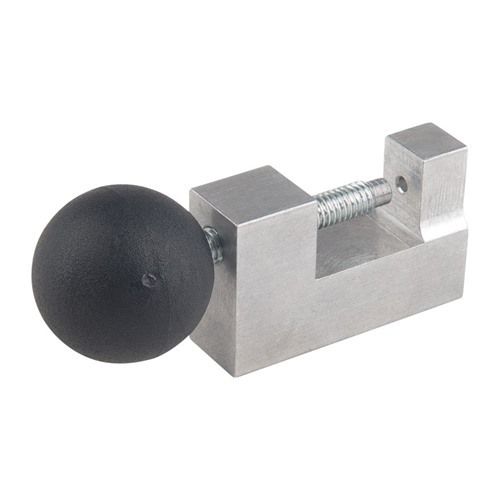 I recently purchased this for my 1st ar build and am glad I did it worked great.I had the trigger guard roll pin installed in about 30 seconds.I suppose if your careful you could just hammer in the pin with a small hammer but that's not the way my luck runs!So overall its a great tool that saves the cost of a new receiver if you break off the trigger guard tab.I would suggest taping either the support side of the tool or the tab on the receiver to prevent marring but otherwise a great tool for the job.Also as an afterthought no issues with pin hardness as mentioned in a previous review. I've removed roll pins in the past to swap trigger guards without the tool, and managed, but there's always that nagging thought that if you make just one slight mistake that you'll ruin the lower receiver. This product alleviates that problem quite well. The roll pin is slowly pushed through in a nicely controlled manner. I added a drop of oil to the front of the roll pin to help it glide through. It took me longer to read the directions than it did to perform the task. I didn't experience any troubles out of it, but to prevent any marring of the lower I would put tape as suggested, or other soft material just to be sure. I mush admit that I was reluctant to purchase a tool to drive one pin into an AR lower. This is a task that I have performed many times with a roll pin punch without damaging a lower. However on a whim I decided to make the purchase. But after one effortless use of this pusher I say "five stars" and "whoo-ray" for Little Crow and Brownells, a truly winning combination!!! 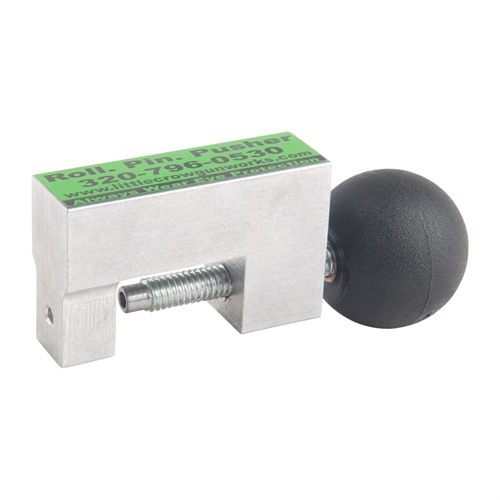 This tool works just as advertised, for smooth and easy installation of the trigger guard roll pin. The only thing which stood out to me was how the roll pin made a cracking noise during installation, with every turn of the knob on the tool. This was not my first AR trigger guard install, but it was my first time using this tool and my first time using a spiral type roll pin. Everything was soaked in CLP, but maybe a moly grease would've worked better. Either way, the tool worked perfectly. I put a piece of black electrical tape on the side which contacts the receiver ear, and ended up with a "scratch-less" trigger guard install. It pushed the trigger guard roll pin out with minimal effort. It will leave an aluminum stain on the receiver where the back section contacts it, so put one or two layers of masking tape on the tool. Get this if you don't want to break the "ears" off of your receiver. The pusher pin wobbled in the drive screw so bad that it was impossible to drive with a straight force to remove a roll pin. (which is the main purpose of me buying this tool). Works as advertised to install pins though. Works as advertised, but the one I received the threads have a rough spot making it a little difficult to turn. Also I had three pins included, one more than pictured. Produsentnr. : RPP1 Lommeformat verktøyet hjelper forhindre bryte kategorien triggerguard eller marring lavere mottaker Fullfør når du installerer eller fjerner roll pin. Verktøyet støtter triggerguard kategorien mens sakte skyve roll pin i eller ut av sin kanal. Inkluderer stål justering pin og tegnestift å hjelpe roll pin fjerning og installasjon.